This song always brings back great memories of being a kid in Atlanta when we would perform this song with Signing Choir. Questa canzone mi fa pensare a quando abitavamo ad Atlanta dove facevo parte del Signing Choir. Ahh Christmas Break, how I wish you still were here. I had a wonderful break and did so much, and yet so little. I spent about two weeks in Salt Lake and then my parents and I dove back to San Diego and they spent a week in San Diego. Ahh, le vacanze di Natale, quanto mi mancano! Quest'anno, ho passato due settimane a Salt Lake e poi, con i miei, siamo venuti a San Diego e loro sono stati qua circa un settimana. The evening I flew in, there was this STUNNING sunset. I forced my brother to stop so we could take pictures. La sera che sono arrivata, c'era un tramonto proprio bello. Simone e' stato cosi' gentile, e si e' fermato cosi potevo fare delle foto. Always love seeing high school friends over Christmas! But we woke up with a fresh dumping of snow on Christmas Day. Perfect. Pero' ci siamo svegliati con una bella dose di neve il giorno di Natale. Perfetto. My mom and I were shopping downtown and we happened across the Macy's Candy Window display and it was so pretty. Everything is made out of candy. In tanto che io e la mamma eravamo fuori a fare dei giri, abbiamo visto le vetrine di Macy's. Tutto quello che c'era e' fatto di caramelle. Era proprio bello da vedere. We then headed to see the lights in Temple Square. It's been a few years since I've been, but it seemed as though there were fewer lights. Regardless, the lights that were there are always pretty. Poi siamo andate a vedere le luci che sono al tempio. E' un po' che non ci vado, pero' mi sembrava che ci fossero meno luci. Comunque, le luci che c'erano erano molto belle. It'd been at least a few years since I'd seen Kelly - so great to see her! One night we went to Sicilia Mia for dinner. They are most known for their carbonara that they make in a cheese form. It was SO good (super rich) but delicious! Una sera siamo andati da Sicilia Mia a cena. Loro sono famosi per la carbonara che fanno nella forma di formaggio. Era buonissima! I've known Leslie forever! Always love seeing her! There was a terrible inversion so while it didn't snow, it frosted. For New Year's, I headed up to Park City. There was a terrible inversion in SLC where the air is bad and the sky is gray. However, in Park City, the sun was shining and there were blue skies. Per il primo dell'anno, sono andata a Park City. A Salt Lake, l'aria non era buona ed era tutto girgio. Pero' a Park City, c'era il sole e cielo blu'! Poor kid, I forced him to take a million pictures with me. You could say that we started 2017 off on the right foot. So fun to spend New Year's with this crew! Simone and I went skiing on January 2. While I am opposed to skiing on non-bluebird days, I made an exception. It was so pretty and the snow was perfect! 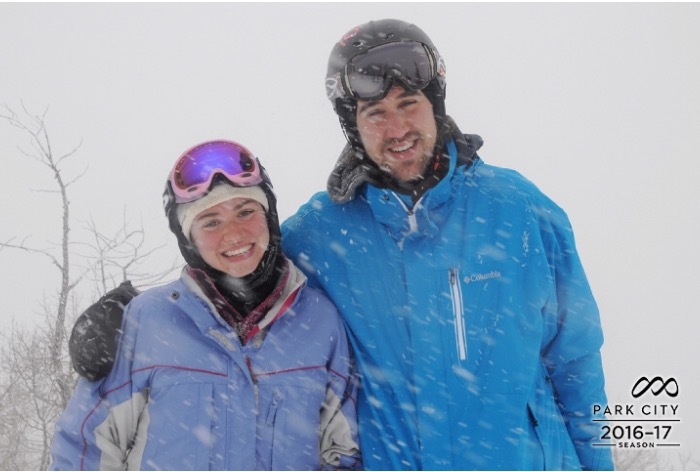 I loved skiing in powder and with my brother. Io e Simone siamo andati a sciare il 2 di gennaio. A me non piace sciare se non c'e' il sole, pero' ci sono andata. Devo dire che mi sono divertita molto. La neve era perfetta. After Salt Lake, my parents and I stayed one night in Las Vegas. My dad booked us a room at the Vdara which was super nice. We had an amazing view of the strip and the Bellagio fountains. Siamo andati in macchina a Las Vegas per una sera. Avevamo una stanza con vista sulla strip e le fontane. Non male. As we were leaving, I realized that in all my visits to Vegas, I never stopped at the sign. We detoured (not really) and stopped. There was a photographer who was so great and took some fun pictures. Jumping pictures were a big hit this time around. In tanto che stavamo per partire, mi sono accorta che non avevo mai fato una foto con il cartello di Las Vegas. Allora, ci siamo passati. C'era uno che stava facendo tante foto - era anche bravo! Back in San Diego, we hung out and laid low. We did make it out to the beach where I shared with my parents the joy of Boomerang. A San Diego, non abbiamo fatto molto. Pero' siamo andati al mare dove ho fatto scoprire l'app, Boomerang, a i miei. Hannahs baby is too adorable!! !